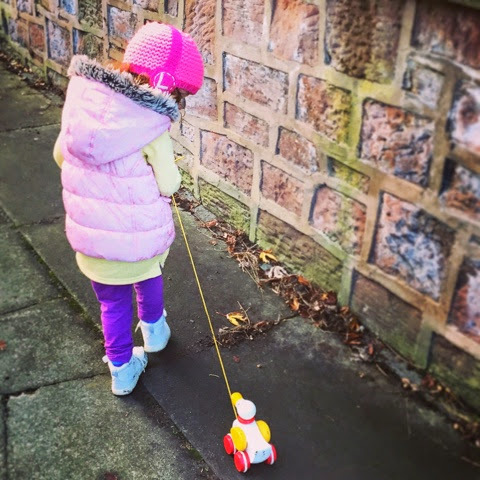 Thank you, yes it definitely makes for a school 'waddle' when we are picking her sister up! That is so gorgeous, bless her. Love her hat too. Thank you, she is a little bit obsessed with that duck! Awwww, I love this! My little ones have a little wooden pull along dog, too! Aww, she has a pull along dog too she alternates with! They keep her out of mischief but makes for a very slow school run! Looks like an interesting day out, love the pull along duck. Gorgeous. Love the colours in her outfit. Her colors are wonderful !